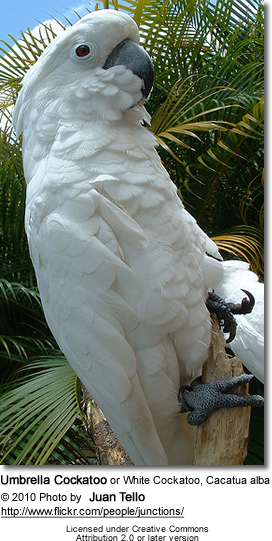 The Umbrella Cockatoo or White Cockatoo, Cacatua alba, is endemic to the islands of Central and Northern Moluccas (aka Maluku Islands) in Indonesia. Specifically, they occur naturally on the islands of Bacan, Halmahera,, Tidore, Kasiruta, Ternate, Kasiruta and Mandioli. Within their natural range, they are found at elevations of 1,000 to 3,000 ft (300 to 900 m) in a variety of habitats, including forests and open woodland, mangroves, swamps and agricultural areas (where they are considered "pests" since they feed on the crop). They are particularly common along the edges of clearings and rivers. Umbrella Cockatoos, like all the other species of cockatoos, are important for the dispersal of seeds -- which has important consequences for the ecology and evolution of plants. 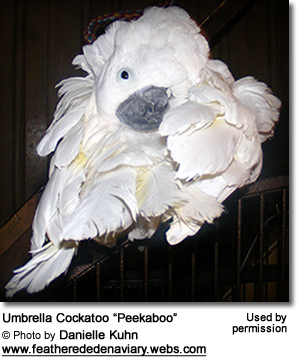 Although the umbrella cockatoo is not classified as an endangered species it is classified as vulnerable. It numbers in the wild have declined owing to habitat loss, hunting and illegal trapping for the cage-bird trade. It is listed in Appendix 2 of the CITES list of protected species. This gives it protection by making the trade of wild caught birds illegal. 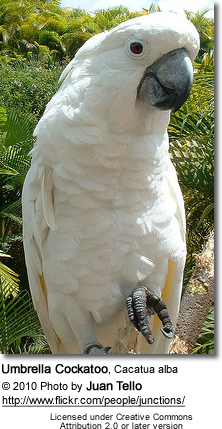 Umbrella Cockatoos can live over 40 years in captivity and 30 years in the wild. There are some claims that some of them have lived to the ripe of age of 100, but this has not been verified. Umbrella Cockatoos are medium-sized cockatoos that weigh between 17 oz (480 g) up to 25 oz (700 g) - the average being 20 oz (565 g). Umbrella Cockatoos are large white parrots with brown / reddish or black eyes, dark grey beaks and legs. The Umbrella Cockatoos was named for its broad, backward-bending crest, which open like an umbrella and fan out. 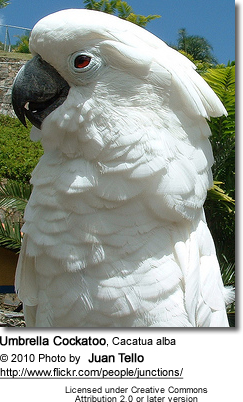 The Umbrella Cockatoos and the Moluccan Cockatoos have the largest and fullest crests. As attractive as the cockatoo crests are, their major purpose is communication. A raised crest can indicate that a cockatoo is displaying for its mate; defending its territory or its flock, calling its flock members; or a cockatoo may be expressing curiosity, excitement, surprise, fear or frustration. For those approaching a cockatoo -a raised crest may be a warning not to touch them - or else risk being bitten. There are some pale yellow / lemon colored feathers on the underside of the wings and tail, which flash when they fly. Both males and females have pale blue eye-rings, but males have dark brown eyes, while females have reddish eyes. The female also tends to have a smaller head and beak than male. Umbrella Cockatoos only breed once a year - usually between December and March, when vegetation growth is at its peak and food is readily available. If his efforts are successful and he is accepted, the pair will be seen preening each other's head and scratching each other around the tail. These actions serve to strengthen their pair bond. Eventually, the male mounts the female and performs the actual act of mating by joining of the cloacae. For bonded pairs, this mating ritual is much shorter and the female may even approach the male. Once they are ready for nesting, breeding pairs separate from their groups and search for a suitable nest cavity (usually in trees). Cockatoos form a close bond that lasts for a lifetime. If they are separated, they may slip into a deep depression. In absence of a "true" mate, they may accept a caretaker as its mate. 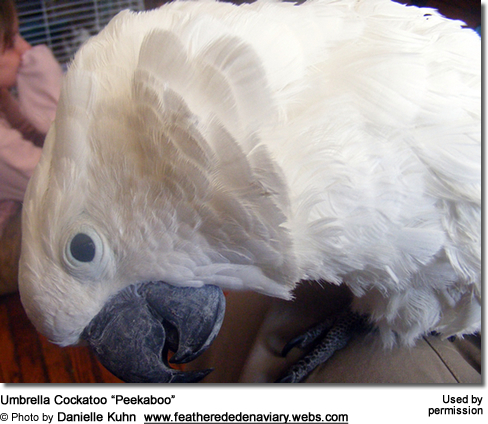 Please refer to this webpage for information on what to feed cockatoos. Umbrellas are very social, needing a lot of interaction. They can be very loud and their calls (a very loud screeching noise) can be heard up to three miles away. 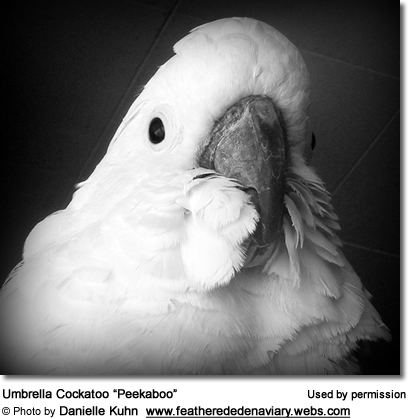 If noise and attention levels are not of concern, hand-reared umbrella cockatoos can make good pets, as they are sociable, intelligent and they can learn tricks and be trained. They can imitate human speech, but generally they are not good talkers. However, they can destroy furniture with their powerful beaks, they can make a lot of loud noise and they demand a lot of care and attention. Their droppings are quite large and semisolid and can be messy. Umbrella cockatoos as pets need so much care and attention, and can be so destructive and expensive to keep, that some pet birds are often passed from one owner to the next. Even hand reared cockatoos however are not really domesticated, and even the sweetest cockatoo can seriously bite and injure a person without provocation. Umbrella Cockatoos equire the largest cage available at least 3' x 3' x5' and need to be out of their cage as much as possible. They are not an easy pet to keep and require a lot of time, devotion and understanding from their caregivers.